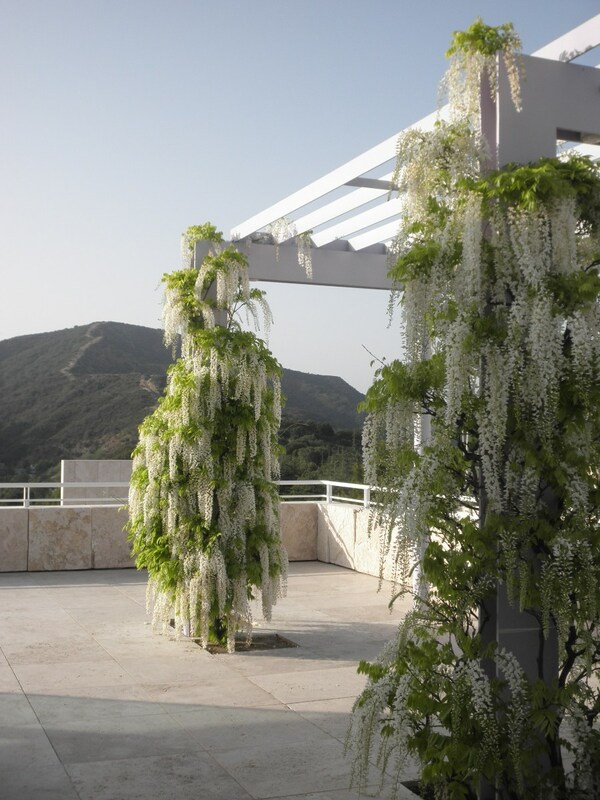 My only visit to the Getty Center was on an afternoon in April 2013. 4 hours away on business for a Las Vegas project, between selling my Albuquerque house and my next move, Los Angeles (LA) was a great weekend escape from familiarity and desert dust. 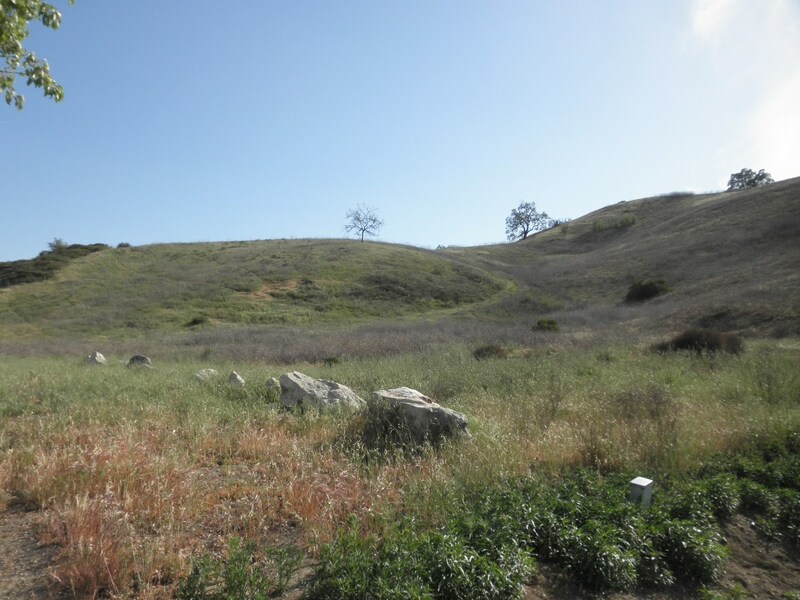 Starting in Calabasas and visiting a friend from the distant past, I can appreciate upscale and Mediterranean climate bliss. The place’s built landscapes and preserved open spaces almost look perfect: proof of talent, embrace of place, and a gentle but thoughtful touch. Surfboards! Malibu is a short, winding drive down the canyon. 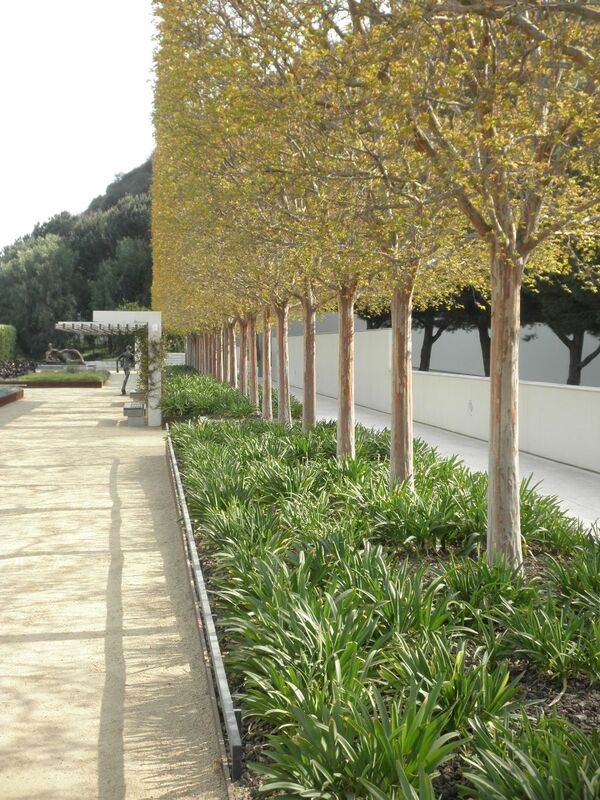 Looking back at my photos of that trip, the visit after lunch in Malibu to the Getty Center was the highlight. 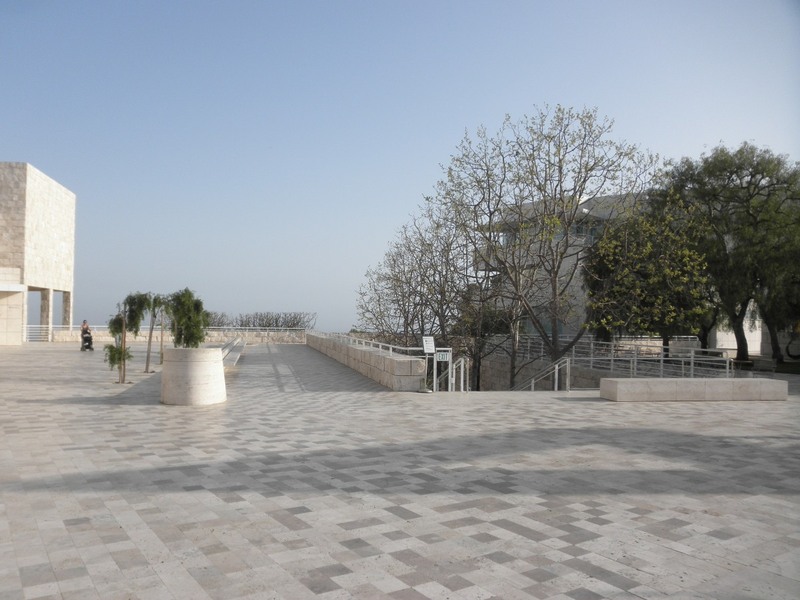 I’m planning a near-term weekend trip back to see other parts of the Getty missed. 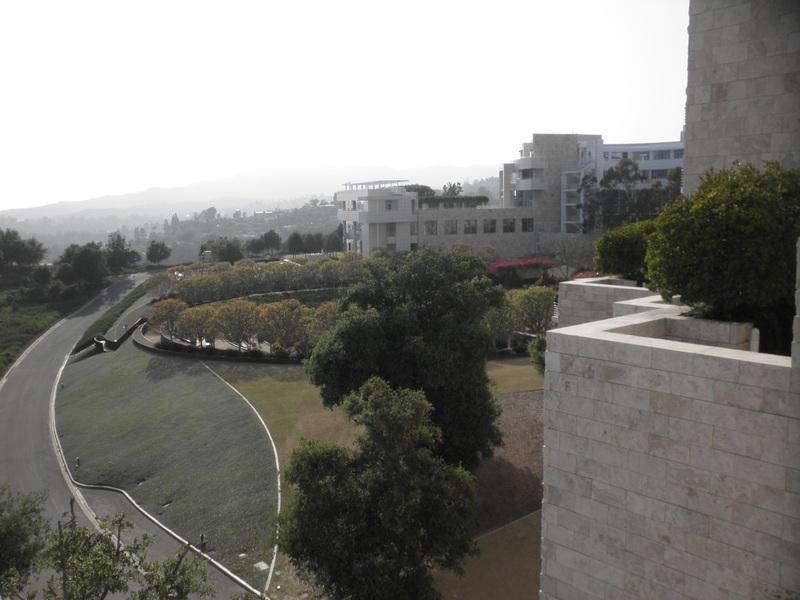 Also, there are now other aspects about my photos of the Getty which I did visit, but I didn’t grab onto back in 2013. White: many of you know I go to Marfa every few months, 4 hours from where I now live. Some of you can tell what I like there. The Getty has some striking similarities of how it’s sited, treated, and feels in huge LA, compared to other architecture and site-specific art in remote, tiny Marfa. Even with major differences in scale and well-contrived formality. 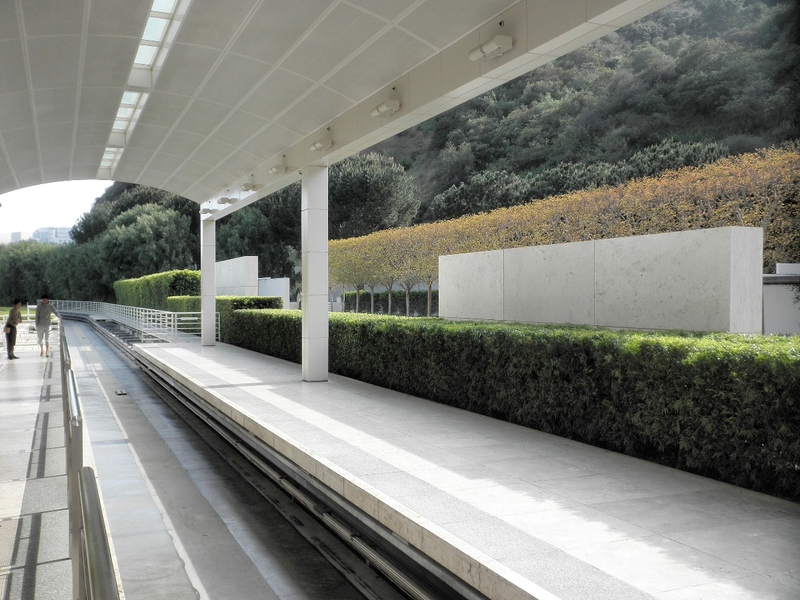 Robert Irwin’s hand is in the design of parts of the Getty and even Marfa. There is good-contrived, but there is terrible-contrived; both require only a bit of thinking to tell apart! I can almost smell the cool, moist marine layer seen as haze in my photos. 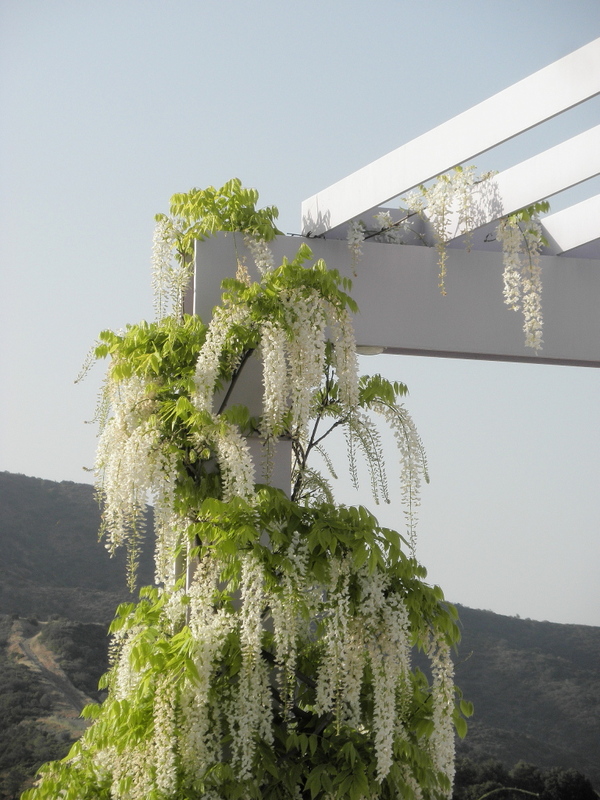 Not to mention the white Wisteria sinensis. Minimalism: clean lines without clutter are a part of so many contemporary art venues or design. Some of it looks trendy or too contrived, similar to a copy. But some of it looks deeper and from the mind and heart, similar to purposed. 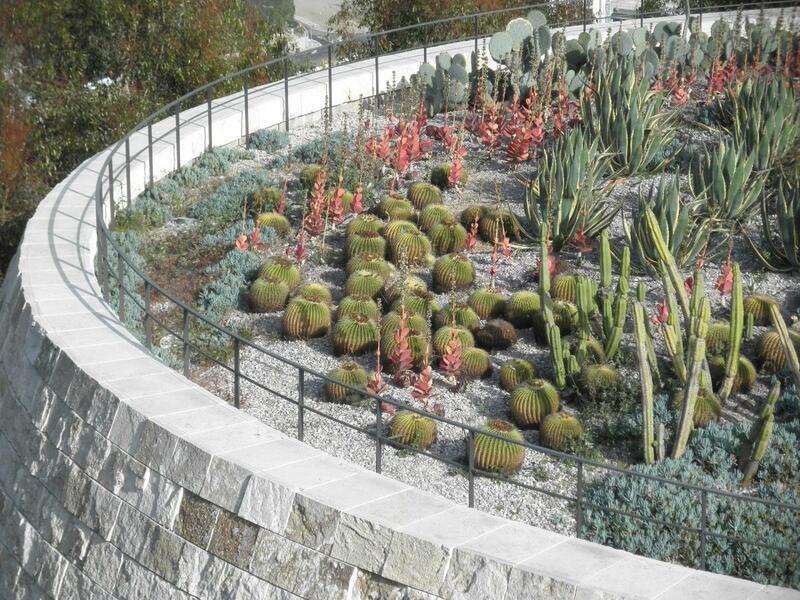 Plantsmanship: the Getty has everyone’s favorite grand feature of what large cacti / succulents can be on southern California’s coastal slopes, Sunset Zone 23. It was great to see that overlook in person, after reading others’ blog posts on it. But there’s much more there. Though it doesn’t hurt to start at the cactus overlook, then work your way back to everything else. The gardens start the moment you walk from your parked car to wait for the tram ride to the main part of the Getty. 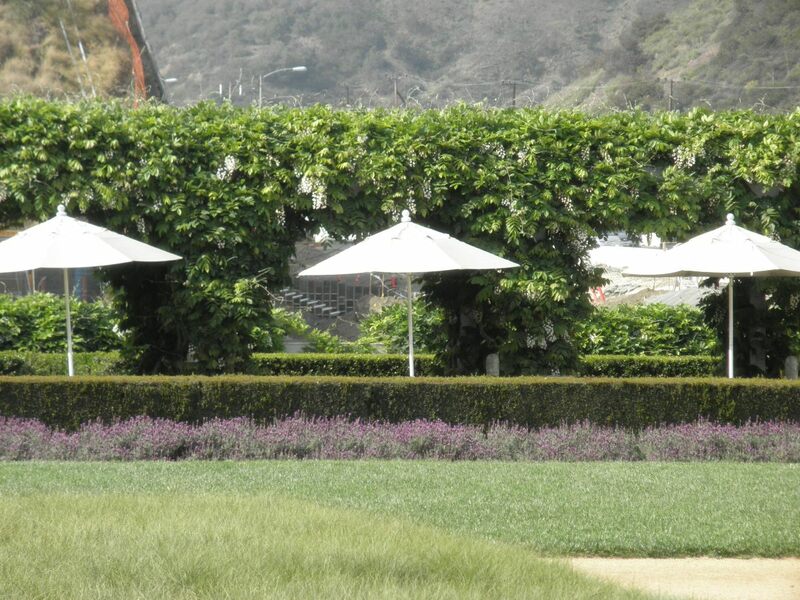 Plantsmanship and horticultural skill rule, including layering, texture, contrast, and even some formal pleaching. The plants make the hardscape and vice-versa. 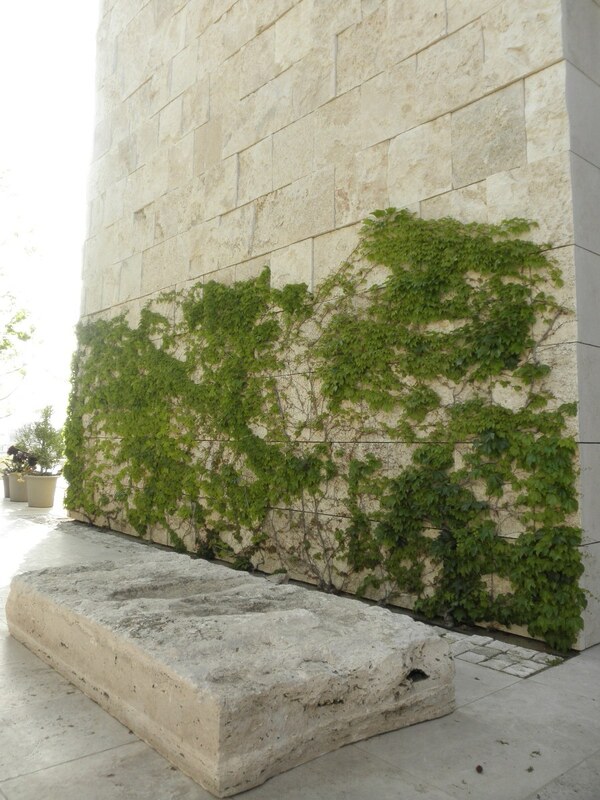 The angled stone paver band at the trees compared to the same stone pavers at the building perimeter really works, as does the Parthenocissus tricuspidata on the wall. Low stone sitting might also work for shorter people, or at least those without hiking and skiing-damaged knees, unlike me. 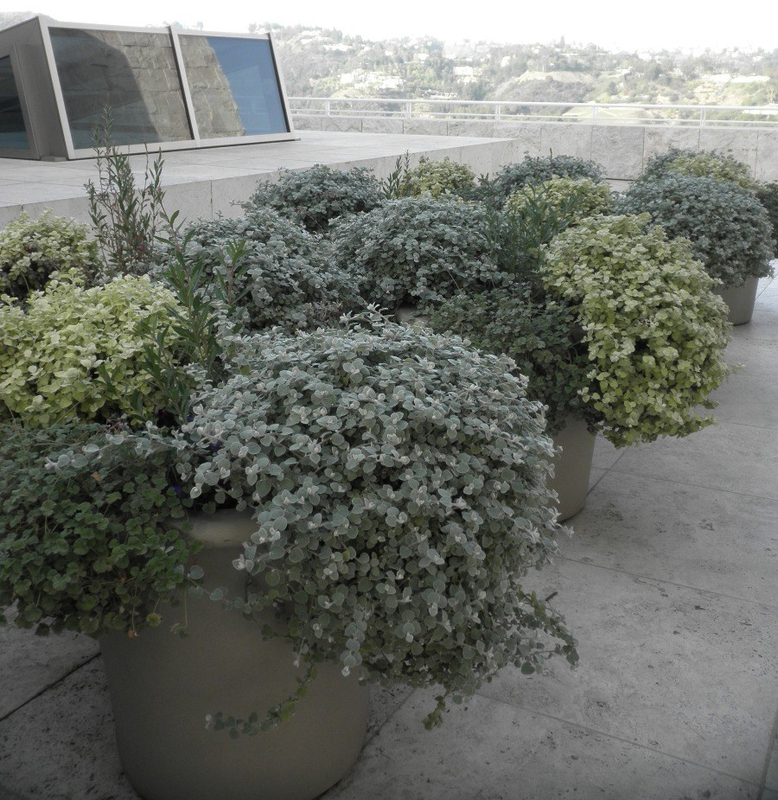 Such Mediterranean plant imagery, with muted greens and fuzzy grays, all mounded and brought closer to eye level via containers. Next time, I’ll look at the garden areas other than the cactus overlook and along the main walkway, plus spend more time enjoying the art exhibits inside. 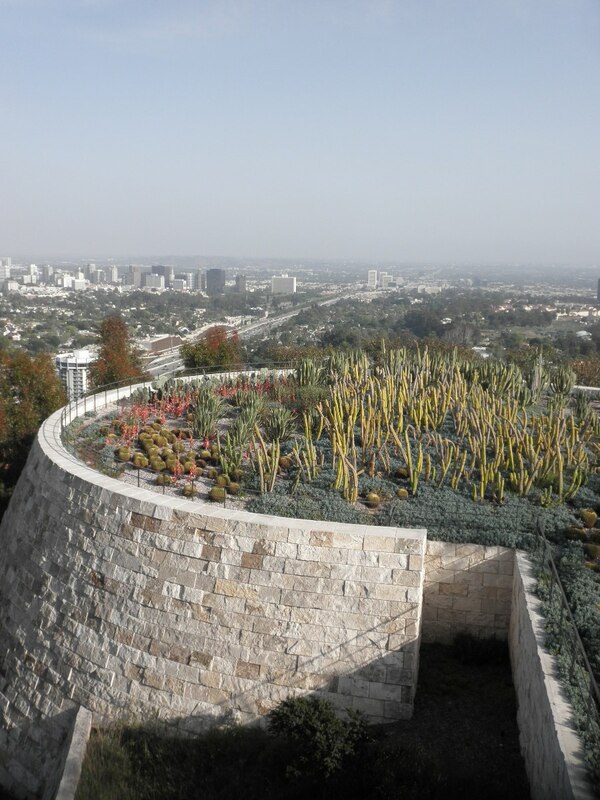 With the nearing of the Getty’s daily closing, I could only look down into this area and hope to return. This is their “Central Garden”. In almost no traffic back to Calabasas, it was a light dinner at Le Pain Quotidien. Including a decent croissant. The next day after a quick return to you-know-where for breakfast, it was back to the desert dust as the unknown unfurled. An unknown that I now know, seen from 5 years in the future. Driving over the mountain, it was soon a straight highway as strong winds buffeted me for 4 hours to Victorville and Las Vegas. I made the occasional stop to see some primo Yucca brevifolia. At the pass before dropping into southern Nevada, I remember the wind grew even colder. 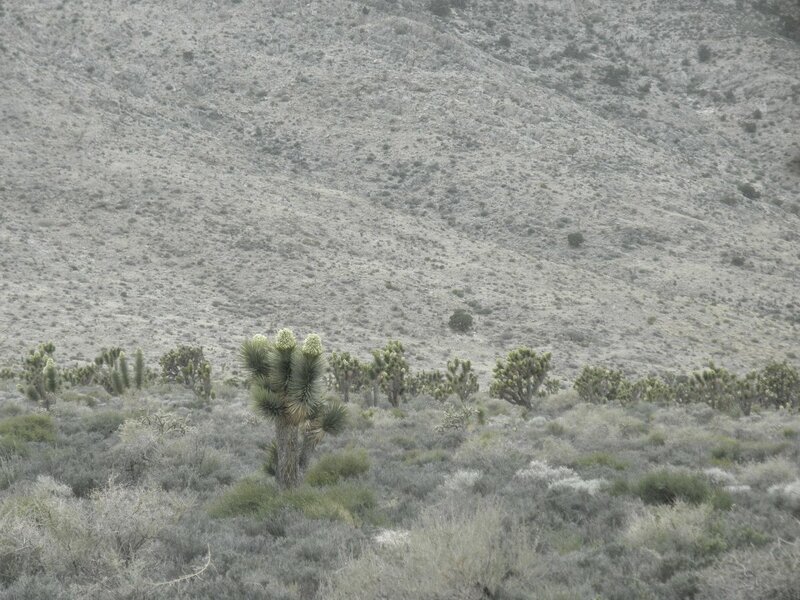 With biting sleet and snow flurries instead of dust, their joshua trees were just then blooming. 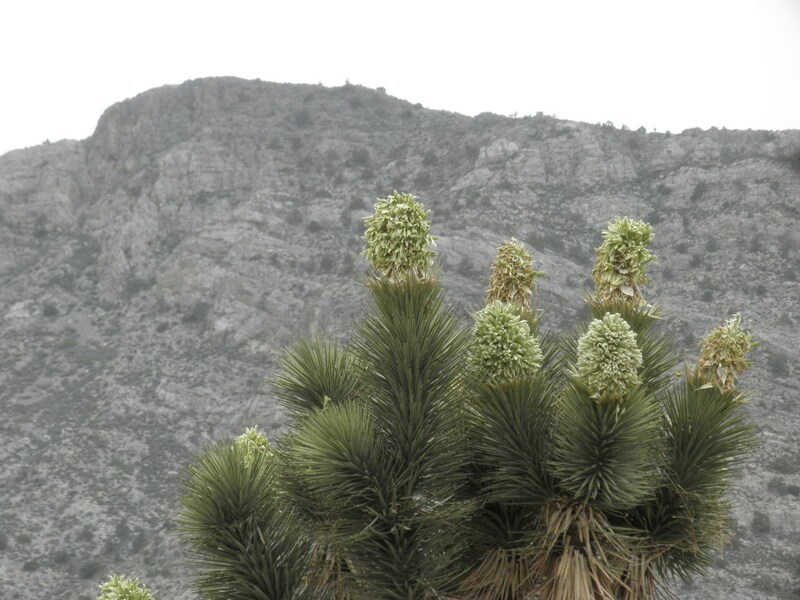 Yucca schidigera and Coleogyne ramosissima joined in. That area, Mountain Pass, is 4,730 feet elevation. 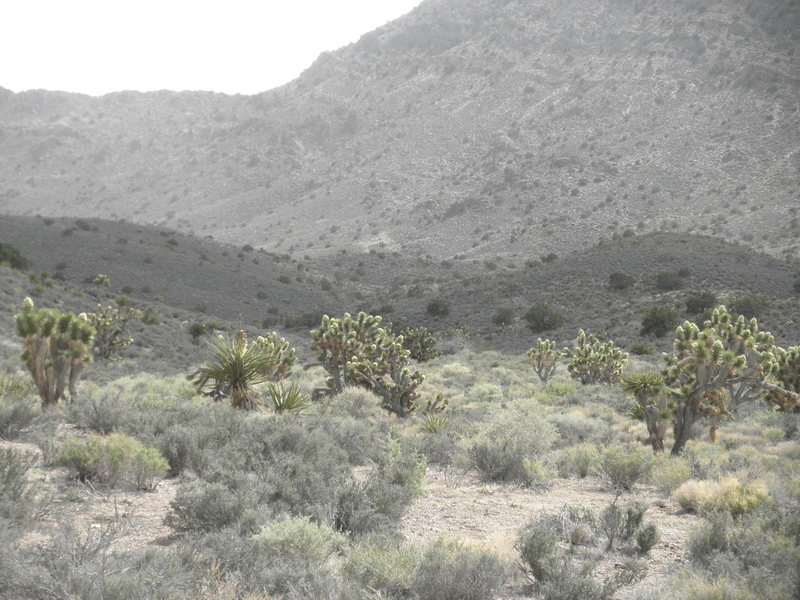 It was still early April in the highest part of the high Mojave Desert. I mostly survived the coming unknown, and it’s now 2018! Date Street, silly! 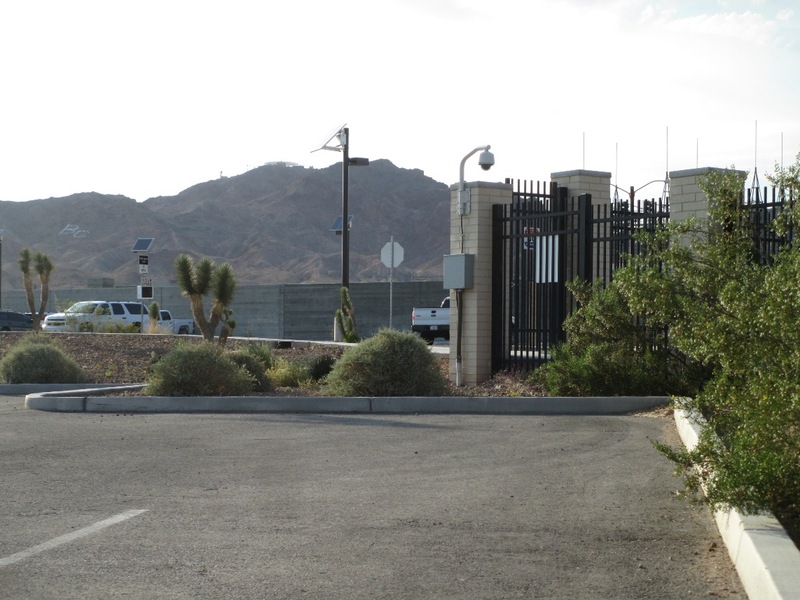 It’s a project I served as the LA on, as part of a contractor-led design-build team for the federal government’s Bureau of Reclamation. And it’s just outside Las Vegas, during a heat wave in already-hot June. 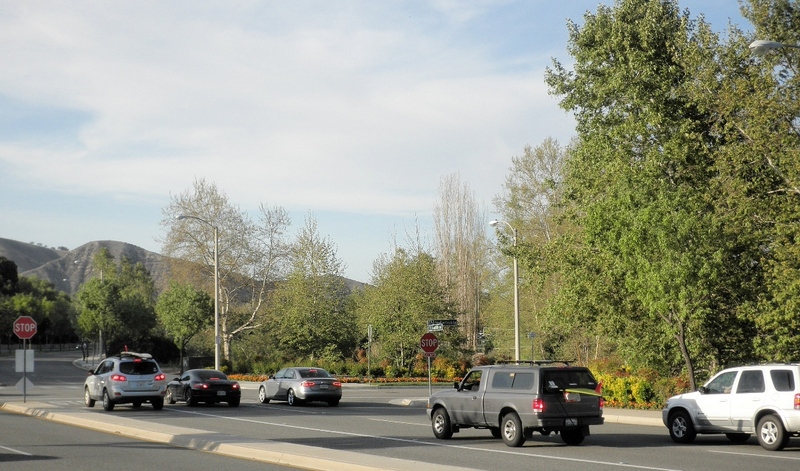 Parking lots are a necessary evil, especially without enough budget and space for many more shade trees. I would have preferred a medium-sized tree for every 4-5 spaces, set into parking space-sized depressed basins, for all 5″ of yearly precipitation to flow into. But that would take out many needed spaces. 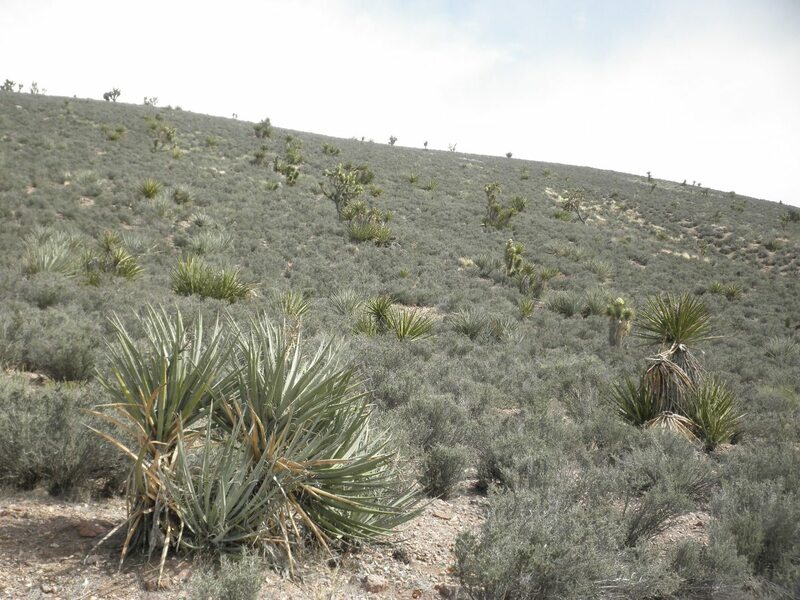 At least nursery-grown-from-seed Joshua Tree / Yucca brevifolia are establishing nicely; so is the dotting of White Bursage / Ambrosia dumosa, with some Creosote Bush / Larrea tridentata, to buffer the lot’s east side. 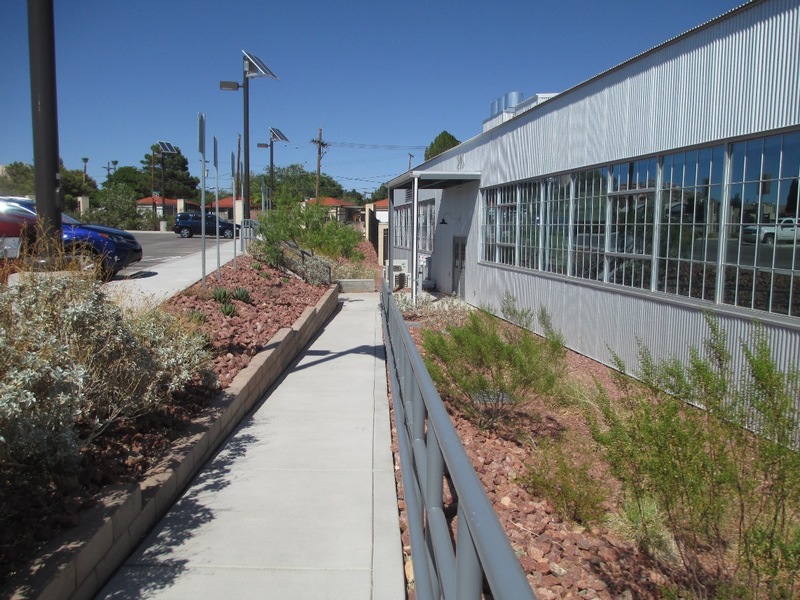 More on the execution, substitute plants and maintenance another time; this area’s function is similar to an arroyo, handling and absorbing runoff, hence Desert Willow / Chilopsis linearis, grasses, and shrubs. Do you see a pattern here, or with my work? 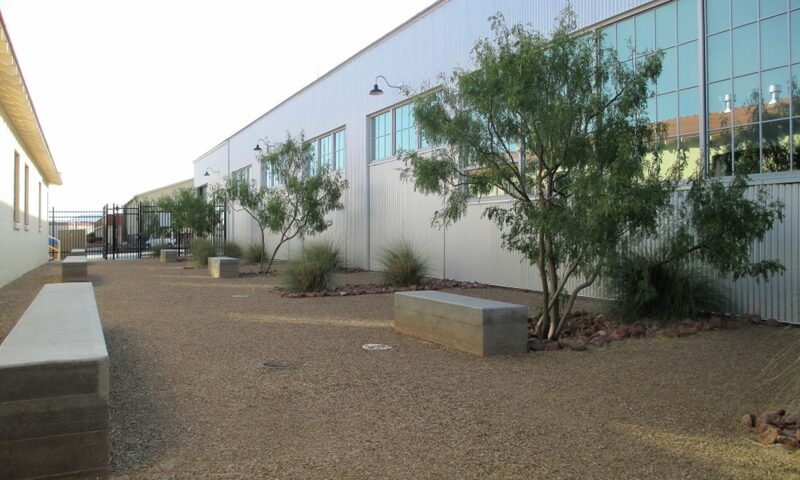 Desert willow, mesquite, desert shrubs, and so on. It’s partly nursery supplier limits and partly what works. 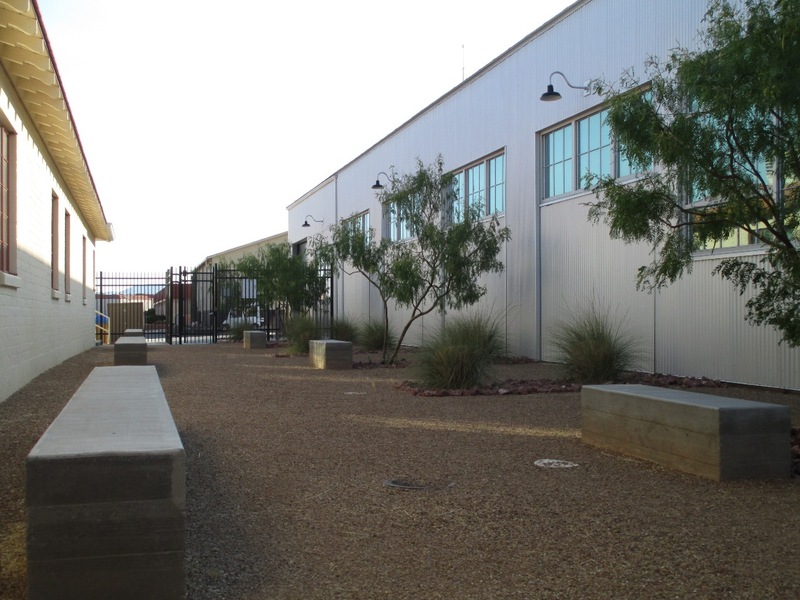 Each project is a similar application of similar plants, but because of each unique site’s character, they don’t come out the same. 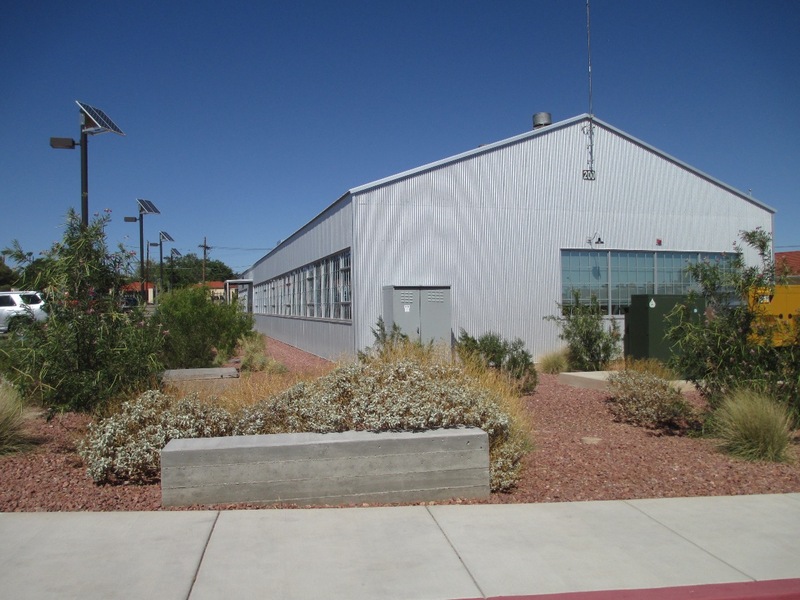 Here, it’s industrial – modern, and in the Mojave Desert – even drier than where I live in the Chihuahuan Desert. Someday, you’ll be able to sit on that board-formed wall in morning shade. So, the mesquites and desert willows became more creosotes with grasses at the bottom. There’s barely 10′ of width at the bottom, plus underground infrastructure like drainage pipes and utilities, so trees would be futile. 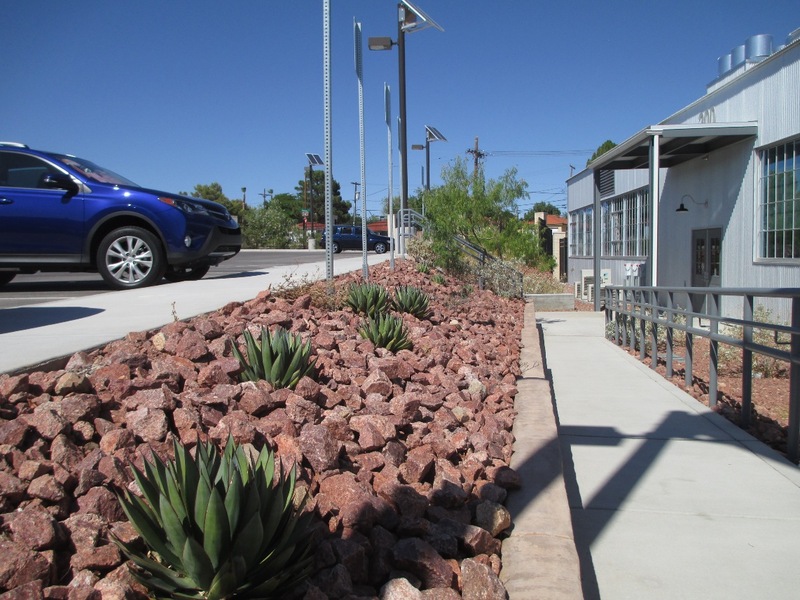 Not to worry, the spiky plants are in a raised area, safe from “conflicts”. Did I say it was down to 105F when I stopped by? Those would be once-valley-native Arizona Ash / Fraxinus velutina. I’m told both trees are being grown from cuttings taken off the remaining Date Street #100 tree, once a duo of ash trees in the original 1930’s planting. 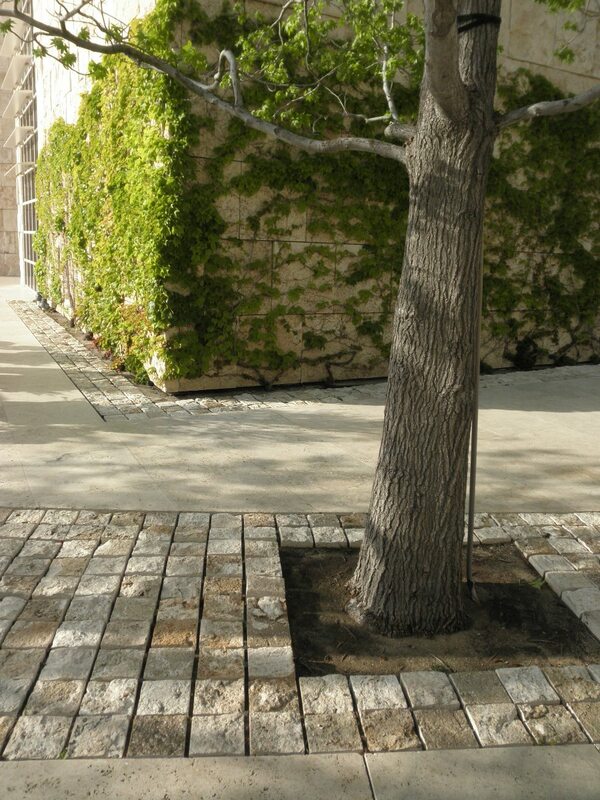 Arborist Dennis Swartzell consulted for the general contractor, and that tree was determined to be in decline, unlikely to survive after required security bollards were built in the root zone. It was removed. That slope should stay more moist and the lawn edge more lush, once it gets afternoon shade. 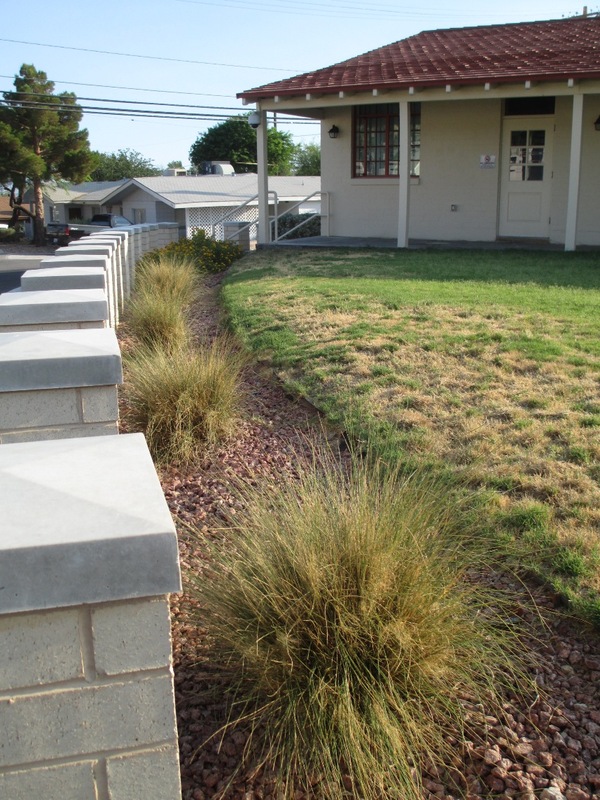 Some personnel wanted a thirsty fescue lawn, instead – this is the most common turf used in Las Vegas. Is it any wonder Lake Mead is near a historic low level, plus drought? 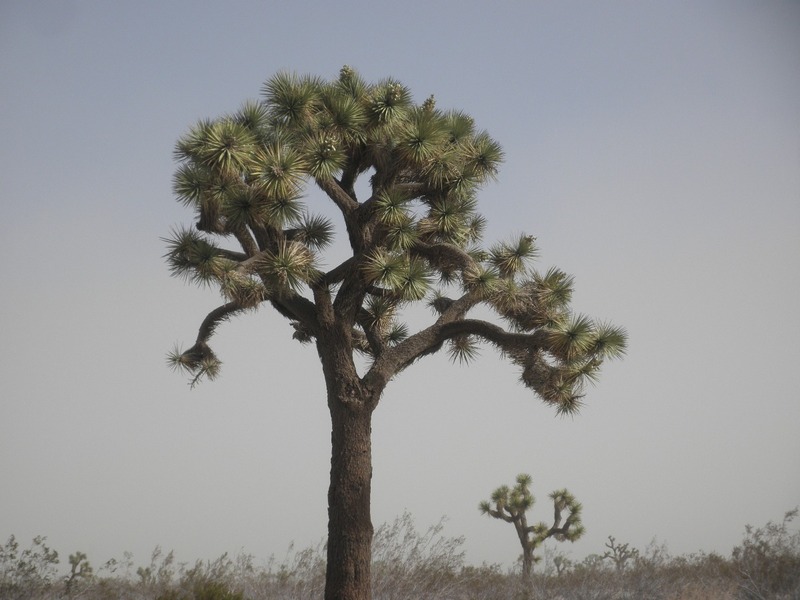 Westerners can do much more, to be at a greater balance with the desert – still grow and advance, still have loads of wildlife and human habitat. More pleasant places to live, that give more than take. Hence I’m a conservationist, not an environmentalist or exploiter. Balance. Simple, modern, and pleasant. Function to let the occasional motorized cart drive through, with form and greenery to let people and songbirds enjoy a break. Like elsewhere on this project, the architect and I placed the seat walls so people could interact, or be alone. In your area, how do you see the need for development balanced with pleasant spaces – even if small? Solutions?